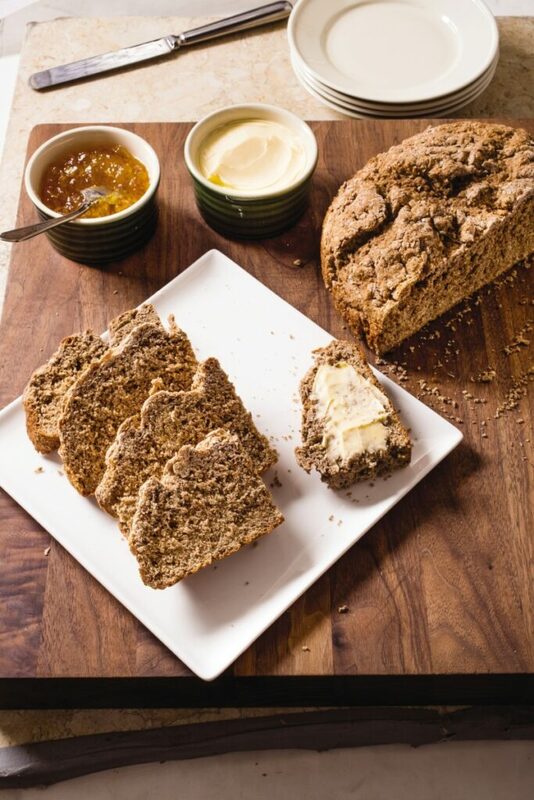 Irish brown soda bread is a hearty, wholesome loaf that tastes as good with scrambled eggs as with a smear of salted butter or tangy marmalade. And not only is this humble bread versatile, it’s simple to prepare. Finally, to force the soft dough to rise upward rather than outward, we baked our bread in a cake pan. Our favorite whole-wheat flour is King Arthur Premium. To ensure the best flavor, use fresh whole wheat flour. Wheat bran can be found at natural foods stores or a supermarket baking aisle. Adjust oven rack to middle position and heat oven to 375 degrees. Lightly grease an 8-inch round cake pan. Whisk whole-wheat flour, all-purpose flour, wheat bran, wheat germ, sugar, baking powder, baking soda and salt together in a medium bowl. Add buttermilk and stir with a rubber spatula until all the flour is moistened and the dough forms soft, ragged mass. Transfer dough to counter and gently shape into a 6-inch round (surface will be craggy). Using a serrated knife, cut a 1/2-inch-deep cross about 5 inches long on top of the loaf. Transfer to the prepared pan. Bake until the loaf is lightly browned and the center registers 185 degrees, 40 to 45 minutes, rotating the pan halfway through baking. Invert the loaf onto a wire rack. Reinvert the loaf and let cool for at least one hour. Slice and serve. To make ahead: This bread is best when served on the day it’s made, but leftovers can be wrapped in plastic wrap and stored at room temperature for up to two days.